Branches, roots and leaves of mangroves are shelter to a variety of insects and animals. Mangroves thrive in salty water environments. Reptiles, crabs, birds and insects, including spiders, are part of the mangrove ecosystem. Mangroves are found along shorelines that provide access to the tide in subtropic and tropical areas of the world. Commonly referred to as the banana spider, golden silk-orb spiders, thrive in the mangrove habitat. They have yellow-green, red or white bodies with striped legs, making the banana spider easy to spot within the mangroves. Females usually grow to about 2 inches, while males are slightly smaller. Banana spiders create complex webs with finely meshed orbs. Yellow silk threads are used to create their webs, direct sunlight reflects off of the web and creates a golden color. Orbs are renewed daily to create a consistently sticky texture used to capture prey. The golden silk-orb spider feeds on butterflies, bees, flies, small moths and wasps. They have a potent venom, however it is not lethal to humans. When bitten, it will cause redness and pain to the local area, but it disappears within 24 hours. The horned spider prefers habitats within mangroves, shrubs, gardens, woodland edges and trees. They are commonly seen in Florida, Jamaica, Cuba, California, Bermuda, Philippines, Dominican Republic, Australia and the Hawaiian Islands. 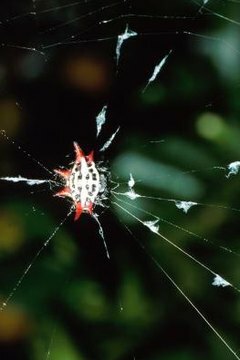 They are also known as spiny orb-weavers due to their thorn-like spines extending from their body. The horns are used as deterrents from predators, however, they are harmless to humans. Whip spiders are small spiders who easily camouflage themselves within their environment. They have a thin abdomen and long legs. When sleeping they align their legs with their body, forming a stick-like shape. They create a web shaped like the letter "Y" to capture their prey. While the web is unusually shaped compared to other spider species, the whip spiders uniquely shaped web allows the them to capture their prey using their camouflage techniques, their long legs and the element of surprise. Tent spiders belong to the Araneidae family. They build horizontal webs with a vertical center, using a tight weave. Its web is nonsticky and appears to look like a tent, easily capturing prey. Webs are spun in tropical areas around the world, with bushes, mangroves and shrubs being common places. This communal species will locate their individual webs close together, at times, adjoining them. The tent spider feeds on butterflies, grasshoppers, insects and flies.